This was one place that a table is hard to get by on a weekend. Don’t expect to get one uninvited on a major weekends, like mother’s, father’s, valentine’s days. So I was surprised when I tried to get a table, 2 hrs before we decided where to go for dinner. The evening started quietly, with only a couple of tables, but as the evening went on the placed filled up quickly. And I am not surprised why. The fare features Australian produce using French techniques. We started with freshly shucked NZ oysters and a couple of soups. The oysters were fresh and chilled, but not exactly alive. However the soups that followed were quite good. The mushroom soup (soup of the day, $12++) was creamy and with a dash of truffle oil made the soup heavenly. The Consomme of Chicken ($14++) that followed was fantastic. Unlike the usual consomme of beef or other French-styled consomme, this Chicken consomme was delicate and not overly salted (死咸). 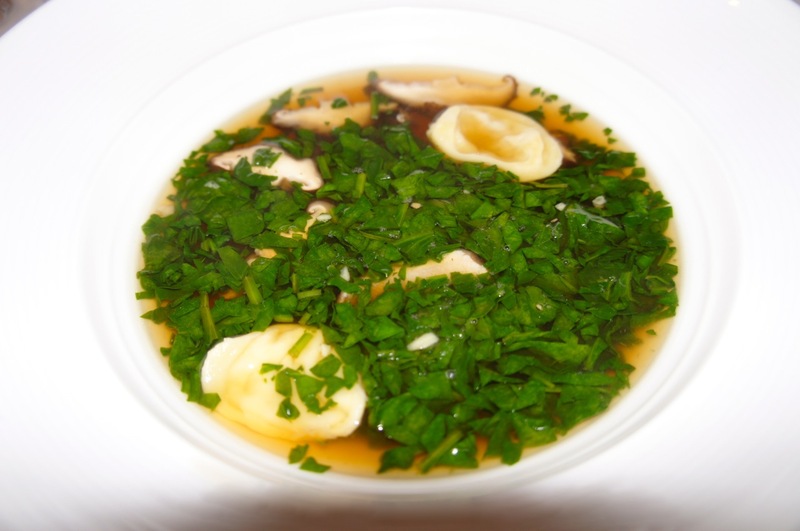 The touch of mushrooms and parsley perfectly balanced with the chicken stock reduction. The soups were followed by a couple of starters. Pan Fried Foie Gras ($28++) was standard, but the Tartare of Beef ($26++) was outstanding. Using a select piece of meat marinated with olive oil and quail egg yolk and marinated just a hint of sea salt and pepper, the tartare was moist and tender. Deparrting from the usual form of thin slices, the little chunks of raw Wagyu beef (I suspect from the tenderloin part) were not chewy. Instead the spread of fats and meat melted in your mouth. 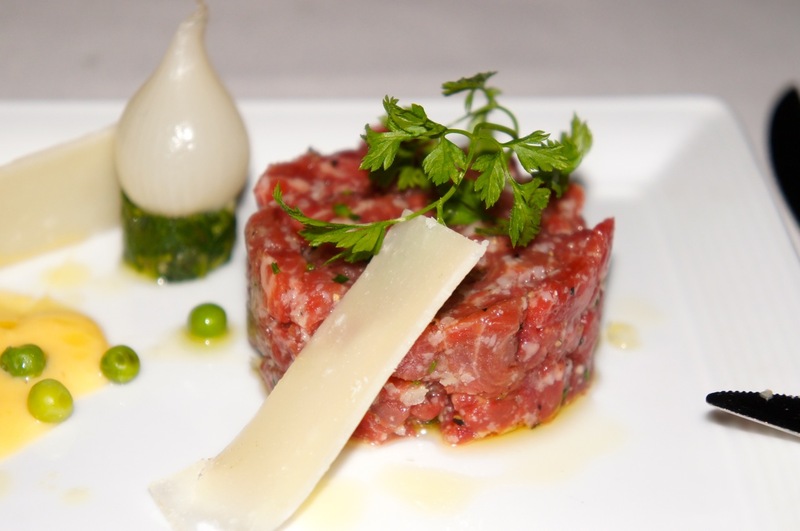 Slices of Parmesan and an egg yolk sauce complemented the tartare. We selected 2 mains and Kid’s meal. The Kid’s Fish Spaghetti ($18+++) was nice, but the fish was a bit too dry in my opinion. Gratin of Lobster ($45++) was a waste of time. Although the gratin was nice, but the lobster was too small for the price. This is the spoiler for the evening. 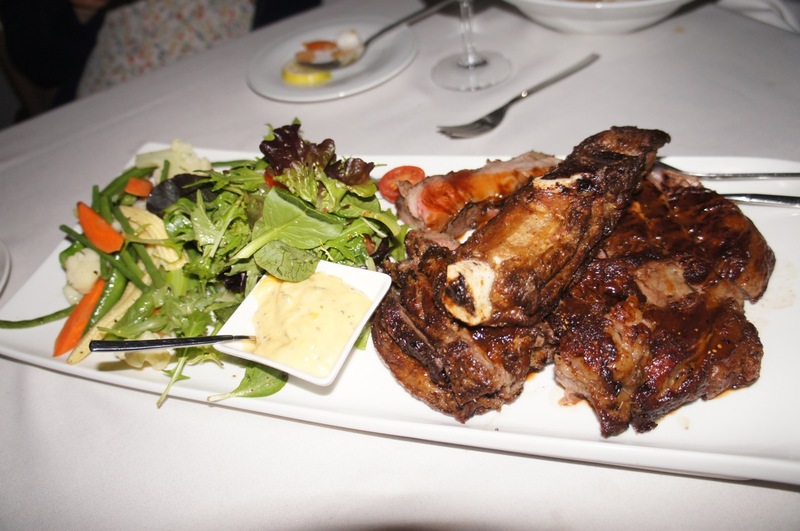 But the piece de le resistance for the evening was the house special – Cote de Beouf. The Cote de Beouf ($120++, serves 2) is a bone-in ribeye that weighed in at 1.2kg, and every gram of tasty goodness. We asked for medium rare with a burnt crust, and the Chef happily obliged. Served with a side of thick cuts fries and salads (a lightly tossed greens and a boiled combi of carrots, cauliflower, baby broccoli, sweet peas and French beans), the meat was done to perfection. It was lightly salted, so if you need a bigger punch, ask for sea salt (which I did). Everything else would spoil the meat. I have left the Bearnaise sauce pretty much alone, and the fresh horseradish marsh I asked for did not lift the meat from it already goodness as well. The portion was big enough for 3-4 for small to medium eaters, and even big eaters like us have the leftovers packed for the best steak and salad sandwich the next day. Ambiance: Nothing to fault. Price: $100-$150 per head, pricey. Food: Good to Outstanding, very consistent through the years. Service: Attentive, and stretch beyond the written so leave a tip!